How does the Arecibo 430 MHz radar make measurements in the ionosphere? A radar can tell where things are and how fast they are moving. How does it do this? It works very much like a radio or TV station. 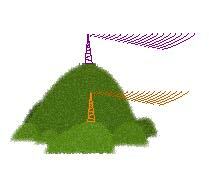 Consider two radio stations located on a mountain transmitting to a nearby city. Why is it that you can listen to either one and they do not interfere with each other? They transmit on different frequencies; that is, their waves vibrate at different frequences. A spectrum shows this to us. If the two stations have turned on their transmitters but are at a pause when no program material is being transmitted, then the spectrum would show just two "lines", like the two gray vertical lines on the graph below. The spectrum shows the relative power at different frequencies. If a station transmits music, then power is tansmitted at other frequencies besides the central line. This is true whenever we transmit any kind of useful information; the spectrum looks something like the black lines. Notice that the two stations are spaced in frequency to avoid interfering with each other. A radar is like a radio station, but it has a receiver that picks up radio waves reflected from objects (targets). Just as the music changes the spectrum of the radio station, the traget can change the spectrum of the radar signal.When a simple target reflects the transmitted signal, one additional frequency is introduced into the spectrum by the target, depending upon its motion. If the target is moving away from the radar, then the wave front that has just reflected from the target has done so farther away from the radar than the previous one, and so it takes longer to get to the receiver than the previous one. Thus the receiver gets fewer wave fronts in a given time than the tranmitter makes, and so the change downward in frequency as shown on the spectrum. Although a radio station transmits continously, a radar can transmit short bursts of waves. It can then receive waves when it is not transmitting. Since waves take longer to return from targets that are farther away, the radar can measure the distances to various targets. In the diagram below, one sees that as time increases, the waves get further from the transmitter. They take longer to get to target 2 than 1, and also longer to return.